I’m holiday so I’ve managed some more reading! 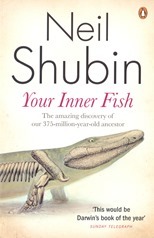 This time Your Inner Fish by Neil Shubin. As recommended by my colleague, David Jones, at ScraperWiki. This is ostensibly a story of a particular distant ancestor of humans, the first to walk on land 375 million years ago, but in practice it is broader than that. It is more generally about what it is to be a modern palaeontologist and taxonomy – the classification of living organisms. 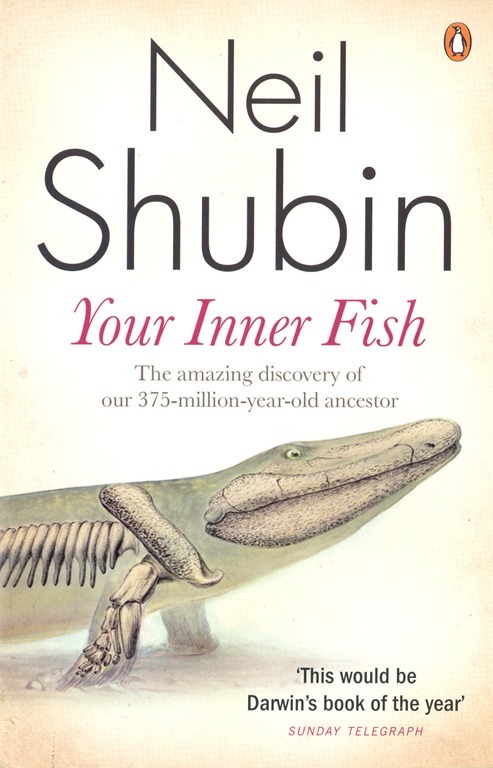 Your Inner Fish is a personal account based around the work Shubin and his colleagues did in discovering the Tiktaalik species, the first walker, in the high Canadian Arctic. It turns out the distinguishing features of such animals are the formation of shoulders and a neck, underwater a fish can easily reorient its whole body to get its head facing the right way, on land a neck to move the head independently and shoulders to mount the front legs become beneficial. Shubin hypotheses that animals such as Tiktaalik evolved to walk on dry land to evade ever larger and more aggressive aquatic predators. Shubin recounts the process that led him to the Arctic, starting with his earlier fossil hunting in road cuts in Pennsylvania. The trick to fossil hunting being finding bedrock of the right age being exposed in moderate amounts. Road cuts are a second best in the this instance, being rather small in scale. Palaeontologists find their best hunting grounds in deserts and the barren landscape of the north. Finding the right site is a combination of identifying where rocks of the right age are likely to be exposed and knowing whether someone has looked there already. Once you are in the field, the tricky part comes: finding the fossils. This is a skill akin to being able to resolve a magic eye puzzle. This is a skill which is learnt practically in the field rather than theoretically in the classroom. I’m struck by how small some of the most important fossil sites are, Shubin shows a photo of the Tiktaalik site where 6 people basically fill it. The Walcott Quarry in the Burgess Shale is similarly compact. The central theme of the book is the one-ness of life, in the sense that humans share a huge amount of machinery with all living things to do with the business of building a body. These days the focus of such interest is on DNA, and the similarity of genes and the proteins they encode across huge spans of the tree of life. In earlier times these similarities were identified in developmental processes and anatomy. It is significant that researchers such as Shubin span the fossil, development and genetic domains. Anatomically fish, lizards, mammals and birds represent the reshuffling of the same components. The multiple jaw bones found in sharks and skates turn into the bones of the inner ear in mammals. The arches which form gills in fish morph and adapt in mammals to leave a weird layout of nerves in the face and skull. These similarities in gross anatomical features are reflected in the molecular machinery which drives development, the formation of complex bodies from a single fertilised cell. Organiser molecules are common across vertebrates. It’s worth noting the contribution of Hilde Mangold to the development story, her supervisor Hans Spemann won the 1935 Nobel Prize for medicine based in part on the work differentiation in amphibian embryos she had presented in her 1923 thesis. She died at the age of 26 in 1924 as the result of an explosion in her apartment building. Nobel Prizes are only awarded to the living. Why study this taxonomy? The reasons are two-fold, there is the purely intellectual argument of “because it is there”. The shared features of life are one of the pieces of evidence underpinning the theory of evolution. The second reason is utilitarian, linking all of life into a coherent structure gives us a better understanding of our own bodies, and how to fix them if they go wrong. As examples of our faulty body Shubin highlights hiccups and hernias. Hiccups because the reflexes leading to hiccups are the descendants of the reflexes of tadpoles which allowed them to breathe through gills as well as lungs. Hernias because the placement of the testes outside the abdomen is an evolution from our fish ancestors who kept gonads internally – external placement is a botched job which leads to a weakness in the abdomen wall, particularly in men. This book is shorter and more personal than Richard Dawkins’ and Stephen Jay Gould’s work in similar vein.